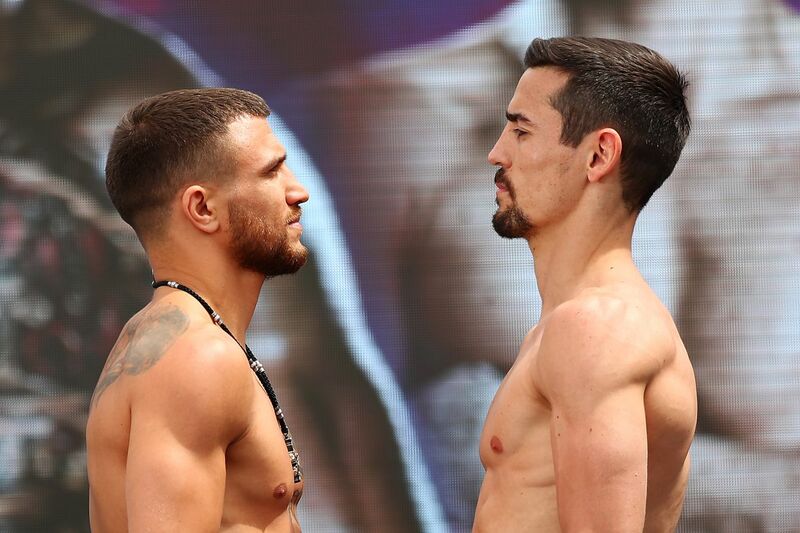 Get results and full fight coverage here for this lightweight championship bout between unified beltholder Vasiliy Lomachenko and Anthony Crolla, starting at 11 PM ET/8 PM PT on April 12th. Join Bloody Elbow for coverage of Friday night’s Top Rank Boxing on ESPN+ telecast, as reigning WBA and WBO lightweight champion Vasyl Lomachenko (12-1, 9 KOs) takes on England’s Anthony Crolla (34-6-3, 13 KOs) at the Staples Center in Los Angeles, California. Is this a competitive fight on paper? Absolutely not. Crolla is a good fighter and former WBA champion himself. But he’s a humongous underdog as the WBA’s mandatory challenger, and he doesn’t figure to be too much trouble for the Ukrainian star. The expectation is we’ll see Lomachenko twice more in 2019 in much bigger fights, including a unification bout vs. IBF champion Richard Commey (28-2, 25 KOs), who was the original opponent for April 12th before withdrawing due to a hand injury. In the co-main event, WBO super-middleweight champion Gilberto Ramirez (39-0, 25 KOs) moves up to light heavyweight for the first time to fight veteran Tommy Karpency (29-6-1, 18 KOs). We’ll see whether or not Ramirez stays at 175 or returns to defend his belt at 168. We will have round-by-round updates of Lomachenko vs. Crolla on the @BloodyElbow Twitter account, along with results of the two main card fights here. The preliminary card begins at 8 PM ET/5 PM PT, followed by the two main card bouts at 11 PM ET/8 PM PT. Everything streams on ESPN+ in the United States, with coverage also available on Sky Sports in the UK and TSN1 in Canada. Lomachenko vs. Crolla should begin somewhere around 12 AM ET/9 PM PT.